Developing a strong brand will help make your marketing efforts more strategic and productive. A focused message will allow for more cohesive communications; improved awareness will make the company's brand easier to establish by creating an understanding and acceptance of the company’s features and benefits. Brand Attributes The most basic description of your products and services. Audience Your primary, secondary and additional consumers, and the interests they take to heart. Competitive Situation Who you’re up against, whether directly or indirectly. Benefits The most compelling, believable alternatives you offer. Brand Personality The characteristics most appropriate to your product and identity – and most appealing to your consumers. 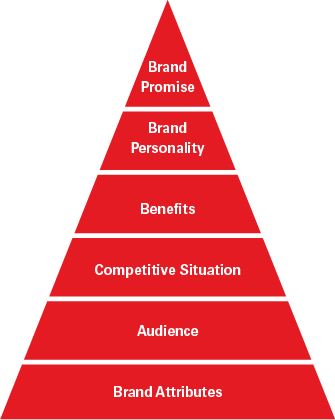 Brand Promise Your brand’s higher calling – and the need it completely satisfies for consumers.